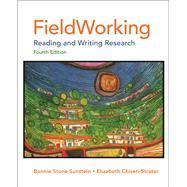 FieldWorkingis a fun and practical guide to research and writing. This acclaimed text incorporates examples by professional writers such as Peter Elbow, Joan Didion, Oliver Sacks, and Jamaica Kincaid, as well as student research projects on communities as diverse a truck stop, sports bar, homeless shelter, and horse sales barn, to help students identify and define their own subcultures and communities. In unique activities and comprehensive instruction, FieldWorkingpresents an ethnographic approach that empowers students to observe, listen, interpret, analyze, and write about the people and artifacts around them, while learning the essentials of college writing and research. FieldWorkingis suitable for courses in English, anthropology, cultural studies, journalism or in any discipline where research is required. BONNIE STONE SUNSTEIN is professor of English and education at the University of Iowa, where she teaches nonfiction writing, research methods, the teaching of writing, and folklore. She directs the undergraduate nonfiction writing program in the English department and coordinates English education in the College of Education. ELIZABETH CHISERI-STRATER is a professor of English at the University of North Carolina – Greensboro, where she teaches courses in rhetoric and composition, nonfiction writing, research methods, and English education. She has directed the Composition Program and served as director of graduate studies in the Women's and Gender Studies program.